Last date for submission of Re-Registration Form and Fee (For MBBS Old Students) is 30/March/2019. MBBS examination will be starting from 15/April/2019 May-2019 Assessment Examination will be starting from 15/May/2019 to 30/May/2019 Ph.D. Course Work is starting from 18/APR/2019 (Thursday). Singhania University Research Entrance Test (SURET) is going to be held on 21/APR/2019 (Sunday). NOTICE:- With immediate effect class attendance is compulsory. Any student falling short of attendance will NOT be permitted to appear in examination. Click here Latest Judgments of Rajasthan High Court on validity of degrees and government jobs. Click here www.singhaniauniversity.ac.in and www.singhaniauniversity.co.in are the only official website rest all are fake. University is located at Pacheri Bari in Jhunjhunu District of Rajasthan at state highway on Narnaul - Singhana - Pilani Road about 150kms. from Delhi and 160 kms. from Jaipur. 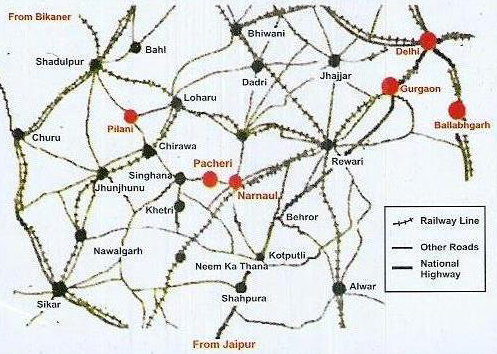 University can be approached from Jaipur via Kotputli - Narnaul, from Delhi via Gurgaon - Rewari - Narnaul and from Jhunjhunu and Pilani via Chirawa and Singhana.